He called for a fresh approach to tackling inequality among member states. PRESIDENT MICHAEL D HIGGINS criticised the European Union for a lack of “social cohesion” and “narrow version of an economic union” in a speech delivered at UCD last night. His comments came on the eve of British Prime Minister Theresa May’s third attempt to secure the backing of MPs in the House of Commons for her deal to remove Britain from the European Union. 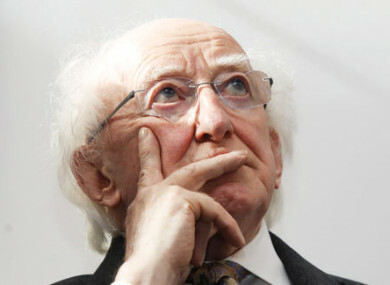 Higgins called for “a new mind for Europe… to strike a unique balance between social cohesion, economic competition and freedom” and to remove the divide he said existed between the “lucky” and the “left out”. “We have entered a period when, I would say – and not for the first time in many years – the future shape of the European Union has become a matter of dispute and often ill-tempered debate,” he said. In his speech at the launch of the Jean Monnet Centre of Excellence at UCD, the president said a social, economic and class divide was palpable across Europe. “A new mind for Europe is required, which requires a casting aside of failing assumptions within inadequate models. It requires new symmetries between the social, the economic, the cultural and the ethical,” he added. “Yet, if the intellectual and political contribution of the union’s members is simply one of reaction and adjustment to a wild unregulated globalisation, the prospects for such are poor. Jean Monnet is considered one of the founding fathers of the European Union and the various centres of excellence across the EU are designed to foster integration and cooperation between member states. Higgins said a return to the founding values of the union – mainly peace and economic prosperity among member states – was needed, and called for a fresh approach to reinforce those pillars. “Too often, as we look to the future, we fail to adequately appreciate the rich but diverse roots of the European project,” he said. Email “'A new mind for Europe is required': President Higgins criticises 'inadequate' European Union”. Feedback on “'A new mind for Europe is required': President Higgins criticises 'inadequate' European Union”.